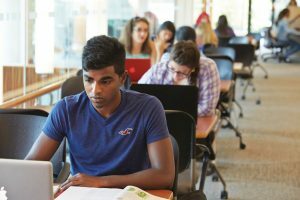 Students study at the Hazel McCallion Academic Learning Centre on UTM campus. Photo: Paul Orenstein.  Note: These are UTM Philosophy’s current program requirements. Students may choose to follow the program requirements that existed at the time of their program selection (available in past academic calendars) or they may follow the current program requirements. It is recommended that all students discuss their course selection requirements with the Undergraduate Advisor, Jane Medeiros, on the 6th Floor, New North Building (Rm. 6180). For an Honours degree, students must complete 10.0 credits in Philosophy. At least 4.0 credits must be at the 300-level or higher, including at least 1.0 credit at the 400-level. Enrolment in the Specialist Program in Philosophy is limited to students who have completed 4.0 credits, including 2.0 PHL credits each with a grade of 73% or higher. At least 1.5 credits in Ethics and Political Philosophy: PHL277Y5 or PHL265H5 and PHL275H5; and 0.5 additional credit from PHL365H5, 370H5, 374H, 375H5, 376H, 380H5, 475H5. It is strongly recommended that students begin their study of Philosophy with PHL103H5, PHL1113H5, or PHL105Y5, and that students planning to enrol in the Specialist Program in Philosophy complete PHL202H5, 210Y5, 245H5, and 277Y5 or PHL265H5 and PHL275H5 by the end of their second year. It is strongly recommended that students begin their study of Philosophy with PHL103H5, PHL113H5, or PHL105Y5, and that students planning to enrol in the Major Program in Philosophy complete at least 2.0 credits of PHL202H5, 210Y5, 245H5 and 277Y5 by the end of their second year. 4.0 credits in PHL or CCT314H5, 315H5, 415H5 are required, including at least 1.0 at the 300/400 level. Through this program, students will gain a deeper understanding of ethical theories and their application in various social contexts, and of particular ethical issues that arise in areas such as health care, the environment, legal systems and political institutions. Students are required to take courses in introductory philosophy, ethics and value theory, as well as within the general Social Sciences. Courses should be selected in consultation with the Faculty Advisor. 4.0 credits are required including at least 1.0 at the 300/400 level. 1.0 credit from PHL267H5, PHL273H5, PHL274H5, PHL277Y5, PHL283H5, PHL365H5, PHL370H5, PHL374H5, PHL375H5, PHL376H5, PHL475H5, or from courses listed in #2 above. 0.5 additional credits from ANT, ECO, POL, SOC, or from courses listed in #2 or #3 above. At least 1.5 credits from AST/BIO/ERS/CHM/PSY/PHY courses at the 100/200 Level (see the Degree Explorer Tool). Students who take PHL277Y5 will count as having taken PHL265H5 and PHL275H5. All 200-level courses, with the exception of PHL204H5, PHL245H5 and PHL247H5, have the prerequisite that the student has completed at least 4.0 credits at the university. This prerequisite is waived for students who are taking or have taken a 100-level course in Philosophy. There are no other prerequisites for any 200-level courses. All 300-level courses, with the exception of PHL 344H5-347H5, have a prerequisite of 1.5 credits in Philosophy. It is strongly recommended that students prepare for 300-level courses by taking two of the following: 103H5/113H5/105Y5, 202H5, 210Y5, 245H5, 277Y5. Some 300-level courses have specific prerequisites or recommended preparation, as described in the course descriptions. Students who do not meet the prerequisite for a particular course but believe that they have adequate preparation should consult the Undergraduate Advisor concerning entry to the course. The prerequisite for 400-level courses, except PHL451H5, is 4.5 credits in Philosophy. Students without pre- or co-requisites or written permission of the instructor can be de-registered from courses at any time. When choosing your courses, keep in mind that not all courses listed are offered every year. Some courses required to complete a program might be offered only every other year. For courses to be offered this year, please visit the UTM Courses page.